On June 6th, US Secretary General Antonio Guterres addressed the UN Security Council meeting on Maintenance of International Peace and Security. He warned the group that by 2050, we won’t have enough fresh water for the people who need it. Demand for water will have grown by 40% by 2050, and 25% of people will live in countries without enough access to clean water. This warning does not come as a surprise. The UN, and other global organizations, have been warning us of water shortages by 2050 for years — if not decades. Among other statements, then-UN Secretary General Ban Ki-Moon warned of water shortages in 2050 and the risk of conflict in November 2016. The OECD called for action on water scarcity in its 2012 document, Environmental Outlook to 2050. In 2010, the UN Environmental Program (UNEP) called for lowering consumption of meat and dairy to protect future water reserves, stating that the population of nine billion people expected in 2050 cannot eat the way we do now and have enough water for everyone. A full 16 years ago, in 2001, the UN Population Fund warned that the world will begin to run out of fresh water by 2050, and UNFPA’s World Population Report from 1992 also warns of water shortages by 2050. Secretary General Guterres focused on the security implications of water shortages last week. He focused on the need to look at water sharing issues as a catalyst for cooperation, not a cause for conflict. This is a serious risk, but it is not the only one. Water shortages bring health risks beyond the danger of violent conflict over water resources. First of all, as UNEP reminded us, you can’t grow food without water. The UN Food and Agriculture Organization (FAO) released a report in 2015 on water in 2050, which focused on water and food security. That report states that “Agriculture is already the most water-intensive industry, accounting in many countries for around two-thirds or more of supplies drawn from rivers, lakes and aquifers.” Without enough fresh water, people go hungry. In addition to conflict and hunger, water shortages bring disease. Diarrhea, in particular, results from being forced to drink or wash with contaminated water. It may seem like an annoyance, but in poor countries, diarrhea kills more children than AIDS, malaria, and measles combined. As many as 842,000 people every year die of diarrhea, 525,000 of them children. Lack of clean water also contributes to the spread of diseases like typhoid and cholera. That’s why they are common in humanitarian emergencies such as Yemen. Water shortages also make hospital care substantially more dangerous. 15% of all patients develop a hospital-borne infections during inpatient care. Most of those infections are in poor countries, because wealthy countries have access to plenty of clean water to maintain equipment and infrastructure to sanitary standards. Water experts have identified three strategies that can prevent and mitigate the impact of water shortages. First, we can share existing water more fairly. The majority of global water sources cross borders and boundaries. Fairer, more equitable cooperation between countries would reduce the number of people in poor countries left without access to clean water. Next, we can develop better ways to filter contaminated water, and reuse household water. This makes more of our existing water supplies available for human use like bathing and drinking. Finally, we can reduce water consumption. 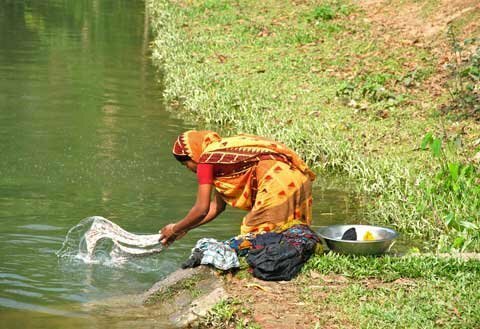 The use of water in manufacturing and at the household level can be reduced without harming quality of life. And as UNEP stated, eating animals requires far more water than plant-based nutrition. If we shift, globally, to a diet that occasionally includes meat instead of eating meat daily, we can reduce agricultural water consumption. It’s a rare global health problem that has an obvious individual response, but global water scarcity is one of them. Eating less meat can actually help ensure a better future for your children. Is Right Wing Populism on the Decline in Europe? Because of Trump? A Member of the European Parliament Explains. Can We Really End Extreme Poverty?